in the West Rogers Park Neighborhood of Chicago. 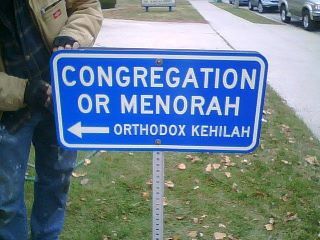 Membership at Or Menorah is less expensive than almost every other synagogue in the area. We provide a supervised children's gan (child care) during services every week. Join us for the holidays, and every Shabbat! Shabbat and Yom Tov Morning Services are at 9:15 A.M.
Shabbat Afternoons: Mincha Ketana/S'euda Shlishit - 30 minutes before Sunset. The West Rogers Park neighborhood is surrounded by an ERUV. This allows carrying nessessary items outdoors on the Sabbath and on Yom Kippur. After filling it out, turn in the form to the Rabbi before erev Pesach.